Champion ad in Erie Daily Times, Aug. 23, 1935. Sassafras St., near the old Plymouth dealership. "World's Greatest Miniature Manufacturing Exhibit." 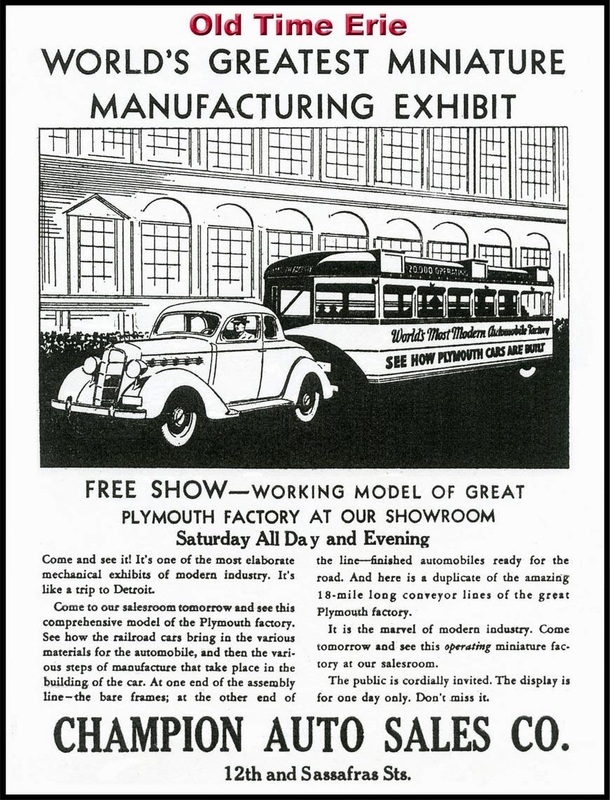 The country was in the midst of the Great Depression, but that did not stop Plymouth from promoting its brand. This enticing free show was held at Champion Auto Sales Co., the local Plymouth dealership, at 12th and Sassafras St., near the other car dealers. It's like a trip to Detroit! "See how the railroad cars bring in the various materials for the automobile, and then the various steps of manufacture that take place in the building of the car. At one end of the assembly line- the bare frames; at the other end of the line- finished automobiles ready for the road. And here is a duplicate of the amazing 18-mile long conveyor lines of the great Plymouth factory." "It's one of the most elaborate mechanical exhibits of modern industry...It is the marvel of modern industry. Come tomorrow and see this operating miniature factory at our salesroom. The public is cordially invited. The display is for one day only. Don't miss it." There is one thing I would like to know. Since this was a miniature manufacturing exhibit, did Plymouth make a miniature car in Erie? As a sidebar, when I saw an illustration of the old Plymouth plant on Lynch Road in Detroit, Michigan I did a double take. At first glance I thought it was a drawing of Central Tech High School / Tech Memorial High School in Erie, Pennsylvania. 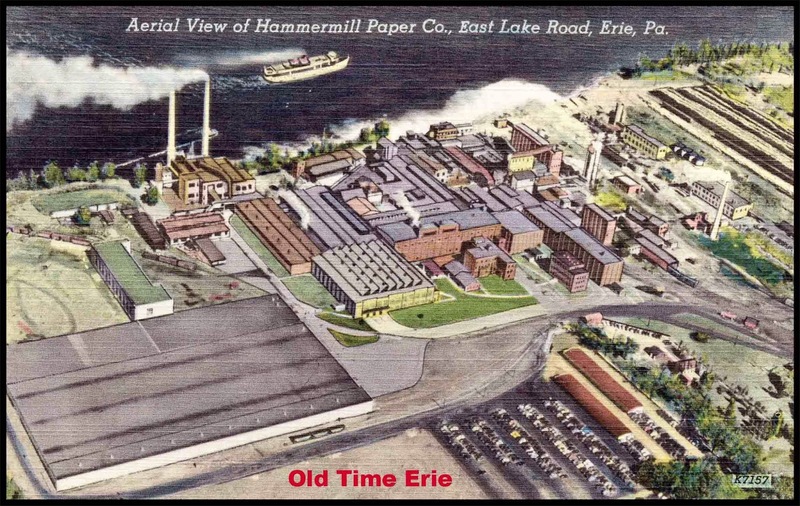 Bird's Eye View of Hammermill Paper Co. from a linen card. Just dropping a quick note to let you know that I haven't forgotten about you. I decided to research my Irish ancestors on St. Patrick's Day and discovered that my great-great-great grandfather, Patrick F. Donnelly, was a veteran of the Civil War! Having survived that harrowing experience, he was one of 17 men who were killed in an explosion in a coal mine in Clinton County, Pennsylvania in November of 1888. So, you can see why I have been neglecting my Old Time Erie duties as of late. As I ease back into a routine, I thought you might enjoy a bird's eye view of the Hammermill Paper Company on East Lake Road in Erie, PA. The plant was purchased by International Paper and, as was the fate with many industries in the region, no longer exists. Stay tuned for more historical facts and old photos of Erie, PA following this brief intermission. 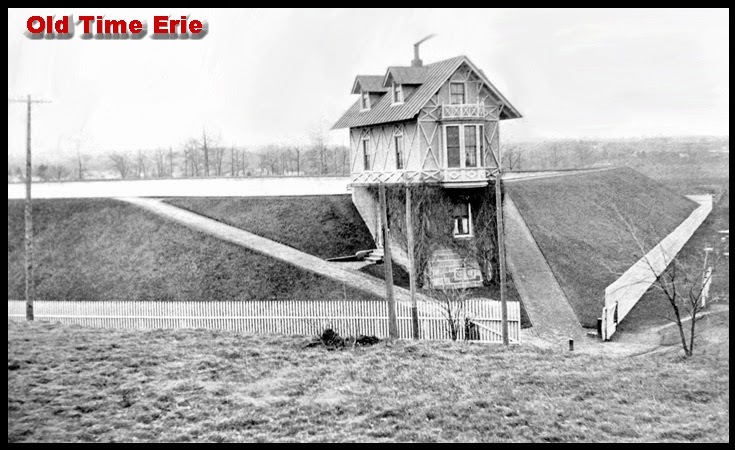 Old Time Erie: Sigsbee Reservoir on West 26th St. in Erie, PA. This photo of the Sigsbee Reservoir on West 26th Street in Erie, PA contains a couple optical illusions. At first I thought the upper portion of the caretaker's house was built on stilts, but the poles are actually on the north side of the fence. I also thought 26th Street was covered in grass. However, since this photo was taken from the ridge of Erie Cemetery, the elevation masks the presence of the road. Regardless of the angle, I think think it's a pretty cool old picture. The reservoir was built on the property of the old Cochran estate on West 26th Street, about halfway between Chestnut and Cherry Street. The property was purchased by the Erie City Water Works in 1871 and the reservoir was completed in 1874. The commissioners of the Water Works borrowed $176,632 on their own to finance this project. Those men included Mr. Reed, Mr. Barr, Mr. Gensheimer and Mr. Liebel.- Erie, Pennsylvania Illustrated (1888). "The pressing need of an early completion of the reservoir, and the difficulty of selling bonds, has led the commissioners to shoulder a responsibility which could not have been demanded of them, and for which they certainly deserve great credit." -Report to City Council by the auditing committee of William A. Galbraith, Judah Colt Spencer and G. T. Churchill. The Sigsbee Reservoir, which holds about 34 million gallons of water, exists to this day. The caretaker's house looks neat at night when the exterior is lit up. 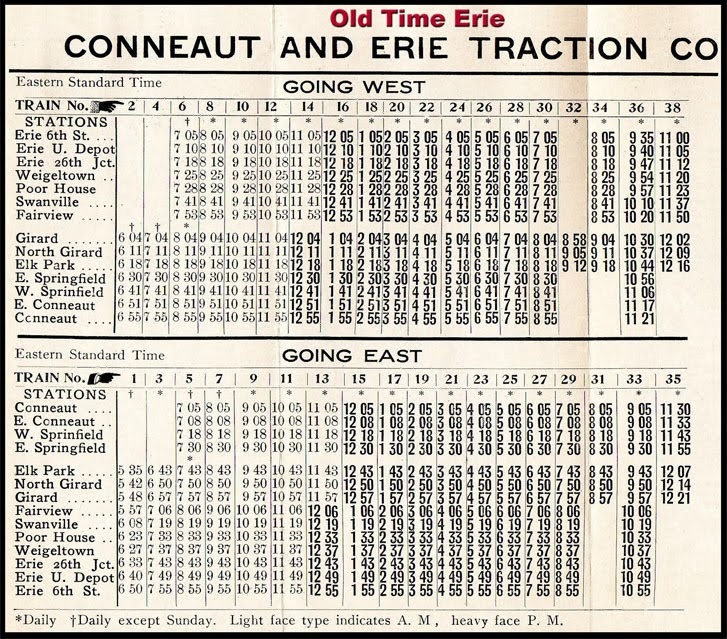 Conneaut and Erie Traction Co. schedule circa 1906 courtesy of Mr. Eagley. All aboard! Today we're going to travel back in time to 1906 and talk about Ken Springirth's favorite subject: Trolleys. Ken is a walking encyclopedia of trolley trivia (check out this interview in the Jamestown Post-Journal), so if you want to read more about trolleys and trains, view a list of Ken's books from the Erie County Public Library's catalog. And while I'm on the subject, Ken Springirth will appear at the Lincoln Community Center in Fairview, PA on Saturday, April 12, 2014 at 1 p.m. to talk about his new book, Remembering the Pennsylvania Railroad. Call (814) 451-7085 for more information. Back to the topic at hand. What I find most interesting about the Conneaut and Lake Erie Traction Company is that you could travel from Perry Square in downtown Erie, PA all the way to Conneaut, Ohio. Never mind that it took one hour and 55 minutes. The printed schedule was very straightforward and easy to decipher. Board the trolley at 7:05 a.m. on North Park Row, travel south on State Street, turn right on West 12th St., turn south at Peach St., then right on West 26th St. to Weigeltown (on which Skip Niebauer is the go-to man). The next stop, as we continue to travel west, was the Poor House (Alms House) near Pittsburgh Avenue, and then on to Swanville. After stopping in Fairview, it would arrive in Girard at 8:04 a.m. and then turn right and travel to North Girard, which is now Lake City, PA. Traveling parallel to Route 5 for a short distance, the car would make a left, a right, a left and another right. The trolley cars were carried over Elk Creek by a wooden trestle. Elk Creek being a destination for steelhead fishing. Next stop, East Springfield at 8:30 a.m., then on to West Springfield, and East Conneaut, reaching the final destination- Conneaut, Ohio- at 8:55 a.m. Ten minutes later the trolley would turn around and head back to Erie following the same tracks. The last trolley to cover the entire distance left Conneaut at 9:05 p.m. and reached Perry Square at 10:55 p.m. It took two hours and 20 minutes to make the trip in 1904. An average of 4,000 passengers per day rode on the Conneaut and Erie line in 1904, and it was quite scenic in the west county. "Probably the most beautiful sections are along the gorges near Elk Creek, Crooked Creek and especially in Walnut Canyon, between Swanville and Fairview." - Street Railway Journal, February 6, 1904. There were occasional delays when Northwestern PA experienced extreme weather events like lake effect snow. Strong winds of sustained speed would cause huge snow drifts across the trolley tracks in wide open farm areas, and winter maintenance was accomplished with a rotary snow plow or a box car fitted with a ball-nose snow pusher. If there was a really high drift, the work was sometimes done by men with shovels! Want more information about Erie, PA? Find it here. 1930 Pennsylvania Department of Highways map. When tourists came to Presque Isle State Park or Waldameer in 1930, they had far fewer choices in planning their trip. This was long before interstates I-90 or I-79 were built, and there were a lot of dirt backroads and side streets. The Sproul Road Bill, which was approved in 1911, created the State Highway System in Pennsylvania. State Highway Routes included SR79 (which appears to be the present-day Route 6-N); SR99 (now Route 5? ); State Route 18, SR98, SR 955, SR 505, SR 832 and SR 89 appear to have retained the same numbers. There were three National Routes in Erie County in 1930, shown on this map as Route 20 (West Ridge Road, West 26th Street and Buffalo Road); Route 19 (Peach Street); and Route 6 (which I think was later changed to Route 97). These stretched much farther than the regular state highway routes. Early roads were made with bricks or macadamized. Some were paved with other materials much earlier than I realized. Bids for roadwork commissioned by the PA State Highway Department were opened on January 22, 1918 for the following jobs: Route 272 in Millcreek Township (now called Route 20), 13,750 feet in length, reinforced concrete (Joseph McCormick bid $76,395); Route 87 (now called Route 5) in Harborcreek Twp., 15,050 feet in length, material not stated (Joseph McCormick bid $82,018) -Municipal Journal, February 2, 1918. There were several alternate forms of transportation in Erie in 1940. The New York Central and the Pennsylvania Railroad made regular stops at Union Station; the New York, Chicago & St. Louis (Nickel Plate) had a terminal at 211 East 19th St. and the Bessemer & Lake Erie Railroad was located at 121 West 12th Street. The Union Bus Depot, at 12 North Park Row in Perry Square was the terminal for Greyhound, West Ridge Transportation Co. and Harmony Short Line. 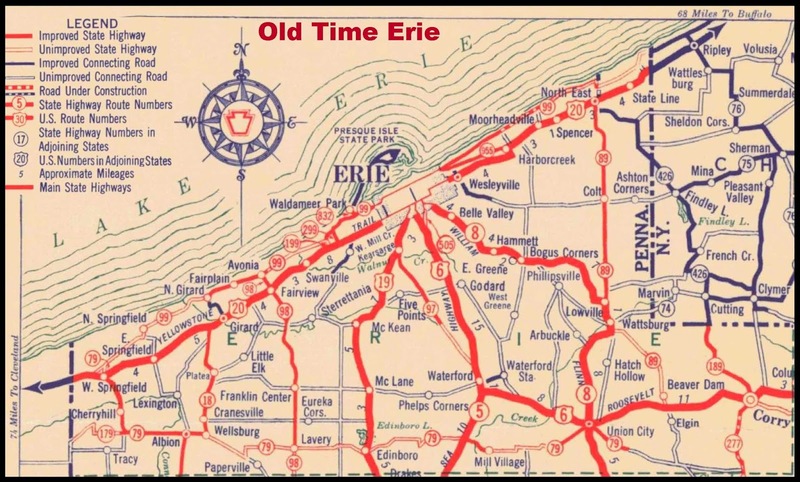 You could hop on an Erie Coach Company bus at multiple points in Erie and ride for a dime. Taxi service was available at a rate of 30 cents for the first minute and five cents for each additional one-third of a minute. A round trip ride on a ferry boat from the Public Steamboat Landing at the foot of State to Waterworks Park at the Peninsula would set you back a quarter in 1940. American Air Lines offered four flights daily departing from Port Erie, the predecessor to the Erie International Airport -Pennsylvania Guide to the Keystone State (WPA, 1940). There were seven hotels, including the swanky Lawrence Hotel, along with all the little cabins and motels along Route 20 from the Ohio line to the New York border. There were also plenty of service stations, where the attendant would pump gas, pop the hood to check the oil, top off other fluids if needed and check the pressure in your tires. When did it become a "convenience" to pump your own gas? A friend brought this up recently and it made me realize how inconvenient it is to stop, get out, pump gas, run to the store, stand in line, pay, hop back in the car, turn the key and zoom off to my destination. It was kind of fun when I first started to drive, but not anymore. Ettwein's still pumps gas for their customers, but I can't think of any other stations that do. Back to the subject at hand. I'm a map geek and I may post more of these in the future if I get enough requests. Longfellow photo courtesy of the Erie School District. "I stuck my neck out for you kids," said the giraffe. "Why do you always have your nose in the air? Do you think you're too good for this class?" said the gorilla. "You seem nice, but a tiger never changes its stripes," said the elephant. OK, enough of the corny one liners. The kids who are sitting on the floor painting were students at Longfellow Elementary School which was located at 509 West 8th Street in Erie, PA. 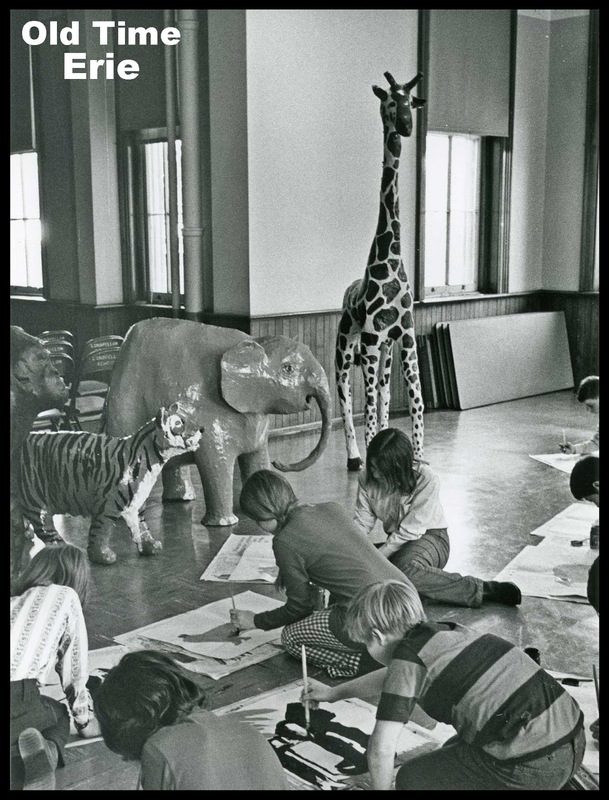 The subjects, from left to right, include a gorilla, a tiger, an elephant and a giraffe. The students... who knows. This scene reminds me of the art class that I used to take in the basement at the Erie Public Museum in the mid-seventies. We met at a nearby school for one summer. We used to listen to the radio while we worked on projects and there is one incident that sticks in my mind. The Charlie Daniels song "The Devil Went Down To Georgia" came on and one of the Borczons jumped up and started singing. This was pretty funny, but we were in hysterics when he played the air fiddle. He would have been a YouTube sensation if only we had a video camera (or access to the Internet). Then again, if I had this incident on video, I probably would have forgotten it long ago. W.P.A. photo by Frederick W. Ritter (1940). I was fourteen in 1949 and the winter was unusually cold in Erie. There was a lot of ice on the lake, so the lake effect snow was minimized, and there was smooth thick ice on the bay, and the perch were biting. My father took me hunting or fishing almost every weekend of the year, and this cold Saturday morning in February was to be no exception. The only problem was that our old car would not start. That immediately damped my fathers enthusiasm for going fishing, as he detested riding the bus to a fishing place and he decided he would rather say home and be warm. 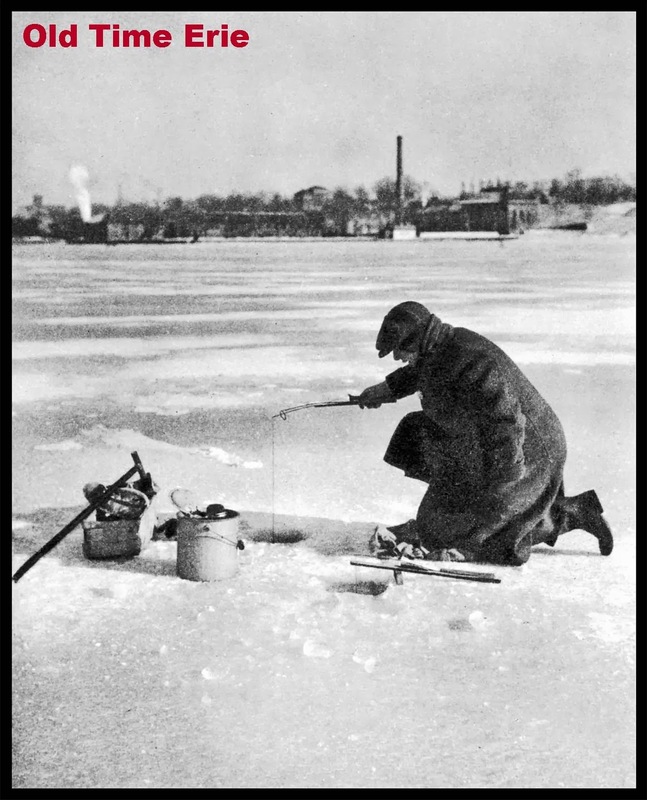 I however, was not daunted by the thought of riding the bus to the public dock, (now Dobbins Landing), so I gathered my ice fishing equipment and headed for the bus stop at East Lake Road and Andrews Park Blvd..
Ice fishing equipment in those days was not very sophisticated. It consisted of a spud (a chisel to chop a hole in the ice), a scoop to remove the ice chunks, a minnow bucket and home made fishing poles that were merely a piece of wood with a old hack saw blade attached with a line guide soldered to the end and two pegs sticking out of the wood to wrap some line around. Attached to the end of the line, was a sinker and a #6 snelled hook. The poles were carried in an eight quart splint basket, along with an extra pair of mittens, incase the ones you had on your hands got wet. The buses on Lake Road (we lived in Lakeside) ran quite regular and on schedule, so the wait was not long, I paid my nickel, got a transfer and soon was at Perry Square. Buses to the public dock were few and far between in February, so after getting thoroughly chilled standing in the bus shelter, I put my transfer in a trash bucket and headed toward the dock. The walk down State Street took me past the Richford Hotel, the Army Surplus Store, Sitterlies Cigar Store, Brebners Ship Chandlery, the Home Restaurant and finally Hamot Hospital were I was born fourteen years earlier. At the bottom of the hill on the West Slip was Smith’s Bait Stand. “Gidge” Smith was the proprietor, a chubby little man with a big smile and a generous net to give you a bucket full of Emerald Shiners (minnows) for a quarter. I was headed for the Cascade Docks, as there were two slips there that were usually good places to fish. That meant walking back up the hill and along the railroad tracks past the Ruberoid Factory, the Water Works, Chestnut Pool, and finally the Cascade Docks. By the time I got there, I was tired from carrying all that equipment and the heavy bucket of minnows. During World War Two, there was a shipyard at the docks, were they made powered barges that made one-way trips across the ocean to deliver supplies and equipment to the fighting troops. My father worked there during the war, and because he had been a merchant seaman, he got to deliver the finished barges to New York City via the Erie Canal and the Hudson River. He then came home by train to begin working on another one. I climbed over the rocks that formed the edge of the slip and walked onto the ice. Surprisingly, no one else was there, perhaps because it was probably ten degrees below zero, and any sane person would be somewhere warm. Our usual procedure was to chop one hole in the ice, drop a baited hook in and see if the fish were biting. If they were, we would chop more holes for more poles, and hopefully more fish. I chopped my hole, dropped the baited hook and immediately got a bite and landed a nice yellow perch. I never chopped a second hole, as the fish were biting so fast and furious, I was catching one after another as fast as I could pull them in and rebait my hook. Eventually, I ran out of minnows. Spread out before me were perhaps one hundred fish, laying on the ice and frozen stiff. I thought to myself, that is enough, I’m tired, cold and hungry. I am going home. The minnow bucket had an separate inner liner that I filled with fish, I filled the outer part of the bucket, and the splint basket and I still had fish left over. They were frozen stiff, so I thought why not just put them in my pockets. I did that, climbed over the rocks and headed down the railroad tracks toward State Street. About the time I got to Chestnut Street, I realized I was trying to carry more than I could. My fingers were frozen stiff, as I was trying to carry two things in both hands. I devised a shuttle system were I would carry two things about one hundred yards ahead, drop them off and then go back for the rest of my gear. This worked fine, until I got to State Street were there people and potential thieves of my fish or fishing equipment. I finally got to Perry Square and safely onto the bus to Lawrence Park. The bus was very warm, and I was thinking life was great, until we got to about East Avenue when I felt a thumping in my coat pocket. The fish were thawing out and coming back to life. My basket and buckets became a wiggling flopping mass of fish. They flopped onto the floor of the bus en mass. My coat pockets thumped like my heart was outside of my skin. Women shrieked. The bus driver stopped the bus and looked at me and said, “What the hell is going on here” “Please just get me to Downing Avenue” I pleaded. He drove off faster than I ever knew a bus to go, as I tried to contain my catch and my composure. I got off the bus, not really knowing if ever got all of the fish back into my containers. I struggle into the back door of our house, put my flopping fish on the floor and took off my coat. My father put down his book, got up from his warm chair and said. “It looks like you had some luck. You better clean them while they are still fresh” I did not go fishing by myself for a long time after that.